The gradual recovery in global economies spells good news for India's export-oriented companies as well as those with huge overseas exposure. Recent numbers suggest that India's exports are shrinking at a slower pace than in early 2009 (see chart India's export trend) and, experts suggest that this recovery is sustainable. "The improvement in exports should be sustained in coming months, aided by rapidly recovering demand from emerging economies, as well as improvement in the major advanced economies," says Nikhilesh Bhattacharyya, associate economist, Moody's Economy.com. Recently, IMF, too, revised upwards its global GDP estimates (see chart Global GDP growth). Importantly, growth in large economies like US, Europe and Japan, which together account for about 60 per cent of India's exports is seen improving in CY10. The recent numbers which indicate that the US and Europe are out of the economic recession is proof of the pudding. "Asia-wide exports are turning up, and India too will benefit from improving external demand that will still remain sub-par in 2010. Improving exports will complement robust policy-induced domestic demand, and boost our GDP growth," says Rajeev Malik, associate director and head India and Asian economics, Macquarie Securities. As the developments suggest, things are changing for the better and could result in earnings upgrades for some of the companies going ahead. "A revival in exports is definitely good news as far as earnings are concerned. But, part of this has already been built in. For instance, Sensex earnings were partly upgraded, as a result of earnings upgradation happened for some of the companies in the IT, auto and metal sectors, which have large exposure to overseas markets. But, from here on we need to really see how these companies are doing in the overseas markets or if there is any earnings surprise," says Hitesh Agarwal, head of research, Angel Broking. Click on NEXT to read further. . . 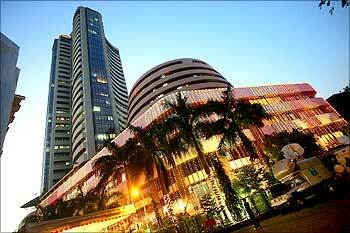 Image: The Bombay Stock Exchange. Nevertheless, as the sales volumes improve and companies take advantage of the revival in global economic growth, investment in some of these companies could prove beneficial. Also, many of these companies are still trading at lower valuations. On the flip side, investors will need to see how various governments react to the recovery (including gradual withdrawal of stimulus packages) which in turn will influence future growth prospects. Meanwhile, to know more about the prospects of the key domestic companies and sectors with a visible overseas exposure, read on. 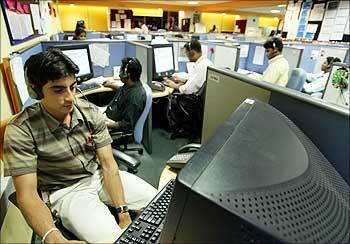 About 60 per cent of revenues for Indian IT companies come from the US market. As the economic situation in US is stabilising, demand is increasing--most IT companies reported a 2-5 per cent volume growth in September quarter on a sequential basis. The concerns, however, still persist as European markets are yet to show a sustainable revival in IT spending, which might be some time away. Besides, the pricing pressure has also not waned and companies are cutting costs to sustain margins. The BFSI segment, which took a big hit last year, has seen a reasonable recovery but, the same is not true for verticals like manufacturing, high-tech and telecom. The benefit has accrued to companies like TCS, which generates about 45 per cent of its revenue from BFSI. Nevertheless, the situation is improving and experts believe that demand would get a boost once the discretionary IT spending increases in 2010 on the back of the global economic recovery. Thus, the larger IT stocks, which have outperformed the broader markets since July this year, should continue to do well. Image: Indian employees at a software firm. While the prospects of domestic metal companies are linked to global developments like price movements of finished products and raw materials, a few companies who have done large acquisitions abroad are more directly impacted. After the acquisition of Corus, UK almost 80 per cent of Tata Steel's consolidated turnover comes from overseas markets. For aluminium major Hindalco, which bought Novelis, overseas markets now account for 70 per cent of its revenues. Last year, Novelis' performance was impacted due to lower metal prices and severe demand destruction in two of its major markets (US and Europe). This took a toll on Hindalco's consolidated performance. While realisations and volumes are looking up in the overseas business, the high consolidated debt acts as a sentiment dampener. For Tata Steel, the improved demand in its major markets like Europe, higher capacity utilisation, cost cutting and relatively higher steel prices should help in the coming days. There has already been an improvement in steel demand in these developed countries on the back of stabilising demand, which suggests that Tata Steel's prospects should continue to improve going ahead. China, too, has been responsible for the uptick in demand for metals. Sesa Goa, India's largest private iron ore miner could benefit given that over 90 per cent of its revenues come from the overseas markets, especially China. The demand revival is already reflecting in prices and volumes-- India's export of iron ore grew by 88 per cent year-on-year to 6.25 million tonne in the month of September 2009, while spot iron ore prices are now around $100 a tonne. Metal pipe companies like Welspun Gujarat, Jindal Saw and Man Industries also stand to gain from the economic revival particularly in oil producing countries (like Middle East). The three pipe companies generate majority of their revenues from overseas markets, wherein experts suggest that capex is reviving and pricing environment improving. They prefer the two larger players namely, Welspun and Jindal Saw. 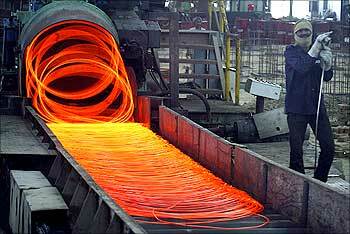 Image: A labourer works inside a steel factory in Kanpur. Initially, as US and Europe provided incentives towards purchase of new cars, automobile manufacturers were able to see a revival in exports. Companies like Tata Motors benefited, as analysts believe that its overseas subsidiary Jaguar and Land Rover (JLR) has seen its sales volumes stabilise in these key markets. However, incentives are now being withdrawn in both the US and European markets. Notably, despite this, sales numbers in the US were better in October 2009, which suggests demand so far has been reasonably good. For October 2009, India's exports witnessed 11 per cent growth. The biggest gains were reported by Maruti Suzuki (exports up 158 per cent), primarily due to higher demand in the European markets. Analysts however, believe that even as global economic growth recovers, growth rates may not be strong next year due to the higher base effect. Among two wheeler makers, Bajaj Auto has the highest exposure to the export markets. In October, the company clocked its highest export sales, which were up 12 per cent y-o-y. Even for the next few quarters, analysts are positive on its export volumes mainly due to higher demand from regions like Bangladesh, Sri Lanka, South Eastern Countries and Latin American markets. In the auto ancillary segment, only marginal recovery is seen in the near-term, but the major gains are seen accruing after 2-3 quarters when inventories at OEMs will get depleted. Meanwhile, the recovery in passenger cars has benefited Amtek Auto, which derives 45 per cent of its revenues from overseas markets. The recovery is also good news for Bharat Forge, which generates about 65 per cent of its revenues from overseas markets, however for the larger benefits to accrue analysts say, "We need to wait and see the demand over the next 2-3 quarters as heavy vehicle segment (yet to revive) will be next to gain from revival." 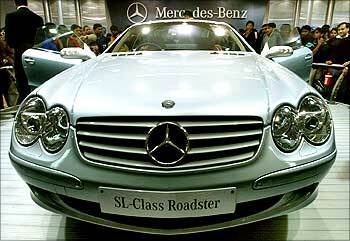 Image: Visitors admire a Mercedes Benz SL500 model during the 7th Auto-Expo 2004 in New Delhi. The improvement in global foreign trade is good news for the shipping sector as volumes and realisation will improve. The Baltic Dry Index, which had plunged to 660 levels in December 2008, has now recovered to 3,600 indicating that freight rates have improved from the lower levels--though still they are lower than 11,800 in May 2008. However, it will be some time before the benefits from economic revival are felt across the shipping industry. "We have only seen revival in dry bulk, but in the case of tankers the demand and the rates are yet to improve. The benefit of this has largely accrued to companies like Mercator Lines (40 per cent of its fleet comprise of dry bulk carriers)," says Kunal Lakhan, analyst, KR Choksey Shares. For companies like GE shipping and Varun Shipping, analysts says better days will only come when the tanker rates rise--they expect the demand for tankers, which are mainly used for transporting oil, gas and related products, to improve next year. 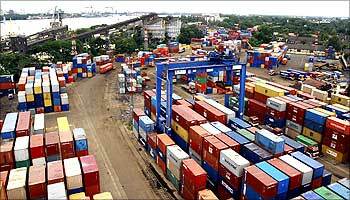 Image: Shipping containers stand stacked at the Container Terminal at the Cochin Port. Concerns of demand destruction from major crude oil consuming countries had seen crude oil prices drop to around $35 per barrel last year before recovering to $70-$75 per barrel currently. Higher crude oil prices spell good news for offshore equipment companies like Aban Offshore and Great Offshore. "In the case of markets like the Middle East, activities in the offshore oil exploration segment has picked up. However, in US and other markets things are yet to revive," says Ajit Motwani, analyst, Emkay Global. Motwani also suggests that as a result of the revival, the day rates for jack-up rigs have moved up to $140,000 currently from $110,000 about 5-6 months ago. But, analysts sound caution as they believe that supply of idle as well as new capacities will keep the day rates in check even if the recovery is strong. Reliance Industries, which generates a large part of its revenues from exports of petroleum products, also saw its gross refining margins (GRMs) take a hit--these dropped to almost $6 per barrel in September 2009 quarter from $13.4 per barrel last year. However, these are expected to improve gradually on the back of the economic recovery. Analysts believe RIL's GRMs will improve to $7.1 in 2009-10 and to $9.1 in 2010-11. 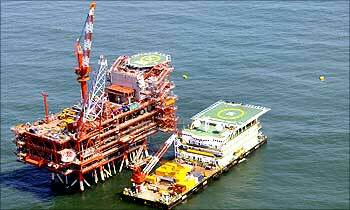 Image: Reliance Industries KG-D6's control and raiser platform is seen off the Bay of Bengal. Most engineering companies took a hit as capex across industries slowed down consequent to the credit crisis. New projects were also postponed, which to some extent was also due to the customers' desire to take advantage of falling commodity prices-customers also started renegotiating (even cancelling) contracts awarded earlier. The hit was more prominent for companies catering to the Middle East markets where capex plans were also impacted due to lower crude oil prices. Punj Lloyd generates about 61 per cent of its revenues from the oil and gas sector and of this about 80 per cent comes from markets like the Gulf region, Europe and Africa by primarily offering services in process engineering, pipelines and tankages. Its orders dropped last year and hence, the business suffered. Thus, a revival in the global hydrocarbon capex is crucial and could change its prospects significantly. A revival will also benefit L&T, which generates about 20-25 per cent of its revenues from markets like Middle East. Notably, L&T continues to gain from improving domestic demand- its management recently upped its order book growth guidance to 30 per cent for 2009-10. In the industrial and power equipment space, many domestic companies had made overseas acquisitions to gain global presence. Crompton Greaves, a case in point, has seen its order book for overseas markets grew by mere 3 per cent in June 2009 quarter. The company believes that growth this year would range 5 per cent, but next year it could jump to 15-20 per cent as a result of the revival in capex. Suzlon is another stock to watch given the revival in demand. Analysts believe that many of its global customers postponed their capex. Its international order book thus dropped by almost half y-o-y to 1,435 mw in June 2009 quarter. The company has also lowered its order guidance for 2009-10 to 1,900-2,100 mw as against the 2,400-2,600 mw earlier. However, a lot would depend on its ability to lower debt on its books. 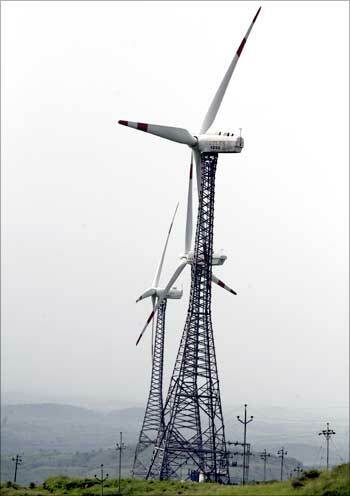 Image: Power-generating windmill turbines are seen in Suzlon wind farm at Sanodar village near Ahmedabad. The fundamentals of textile sector are turning around for the better. The economic revival has helped foreign retailers, particularly in the US markets, in increasing footfalls and post relatively better sales, which has lead to a pickup in India's textile products. Between April and September, India's man-made textile exports grew by 26.3 per cent y-o-y in rupee terms. Companies like Gokaldas Exports (a large garment exporter) and Welspun India (earns 80 per cent of its revenue from exports) could be among key beneficiaries of this revival. In gems and jewellery, companies like Gitanjali Gems and Rajesh Exports could gain as exports of gems and jewellery which plunged by 26.9 per cent in April 2009 are seen recovering--these shrunk at a lower rate of 7.8 per cent in October 2009. For pharmaceuticals players, the economic revival will benefit them in the form of higher R&D spending by companies in the developed world which is positive for CRAMS players like Jubilant Organosys, Piramal Healthcare, Divi's Laboratories and Dishman. Also, the easing of credit in East Europe and Russian markets should benefit companies like Dr Reddy's and Ranbaxy. 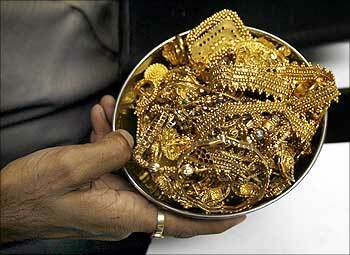 Image: A trader holds gold jewellery at a shop in Mumbai.